Brand New Construction, Gorgeous, Large Lot! Hello, I am 819 W. Euclid Ave in El Centro. I am brand 4 bedrooms and 2 bathrooms new home with amazing beauty. Elegance, modern design, beautiful ceramic tile, large family room is jaw dropping and amazing. I have stylish, modern and spacious kitchen with bar style seating and granite countertop. Beautiful Samsung Stainless Steel appliances are to entice your cooking experience. Master bedroom has large walk-in closet and access to back patio. 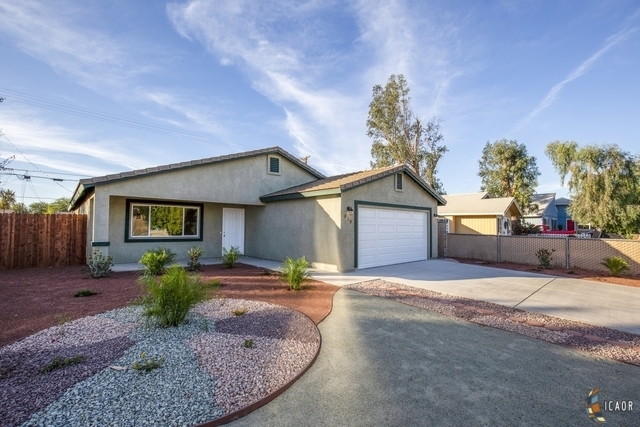 Eye-pleasing low maintenance desert style landscaping, finished garage, separate laundry room, spacious bedrooms, LED and recessed lighting, tankless water heater, and walking distance to upcoming aqua center and business district. Large covered patio is already there for you to enjoy, so you don&apos;t spend money to build after purchasing home. I have large back yard with alley access for your RV and desert toys. I am a rare find and waiting for you to call me your HOME.